Welcome to our living room. It's the first room you see when you enter our home. It's nothing fancy or formal. And it's quite eclectic. 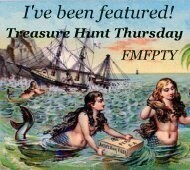 Most of the items in here are vintage and were found at estate sales, thrift shops, or antique shops. Since this house doesn't have an official dining room due to a previous remodel that combined the former kitchen and dining room, we use this room to eat in when we have a large group over for dinner. It takes some major furniture rearranging, but it works. And now you also know why we have our china cabinet in here. You just have to work with what you have! The living room is blessed/cursed with a 15' wall of floor-to-ceiling windows overlooking our covered deck and back yard. Blessed because I love the open feeling it gives the room. Cursed because it's so hard to arrange furniture in here. It's also completely open to our entry, which is small, around 8' x 6'. The spaces are physically separated by a built-in, 2.5' tall, brick planter and visually separated by the different floors in each space. This is the umpteenth way I've had the furniture arranged in the room and I think I like this. For now anyway. The china cabinet takes up quite a bit of the very limited wall space and placing the sofa in front of it seems to work. Again, for now. You're looking at the only actual walls in the room. You can see on the right side of the picture (above) where the wall ends. The corner of the slate floor in the entry can be seen. I snagged the wing back chairs at an estate sale around 15 years ago. The quilt was a find from a local antique shop a couple of weeks ago. I just love the whimsical fabrics on it. The bookcase in the background belonged to my husband's grandparents. And the granny square throw on the other chair (in the very last picture) is a thrift store find. Why yes, that is an outdoor wicker table at the far end of the room. It belonged to one of my sweet former neighbors in Nashville, Miss Betty. 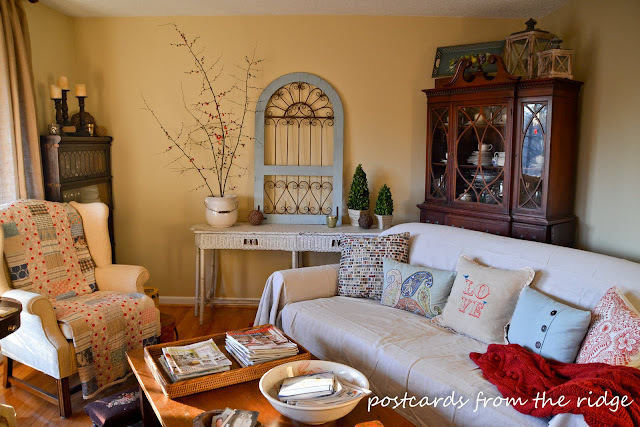 She lived across the street from us and had this table and a gorgeous antique wicker chair on her front porch and I always loved looking at them when I would sit out on my porch swing. 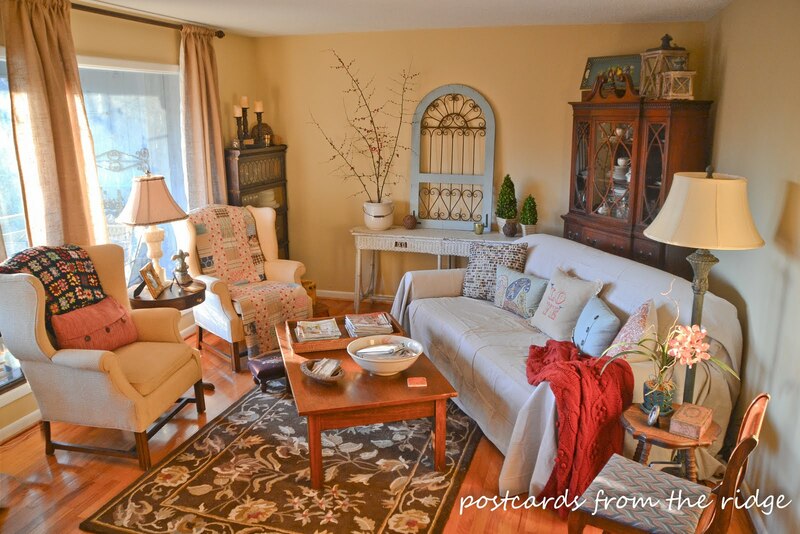 When she moved into an assisted living home several years ago, her granddaughter had an estate sale and I bought both the table and chair along with some other nifty finds. I had the table on our covered deck for a long time, but needed a console table in here and always adored this one. I cleaned it up a bit, brought it inside, and have loved having it in here ever since. The quince branches on top of it are sitting in an old ironstone-looking chamber pot that I picked up at an estate sale a couple of years ago. I have a few more pictures of it here, along with some tips on force-blooming branches. 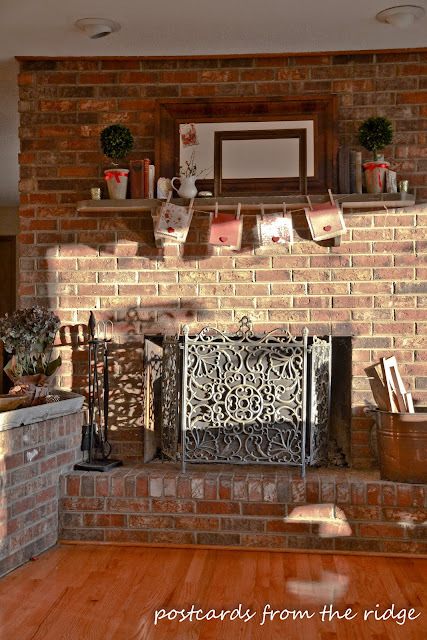 On the opposite side of the room from the wall with the wicker table is the fireplace. The previous owners had never used it, but I love a fire and build one whenever I can. The copper container holding the wood came from an estate sale several years ago. 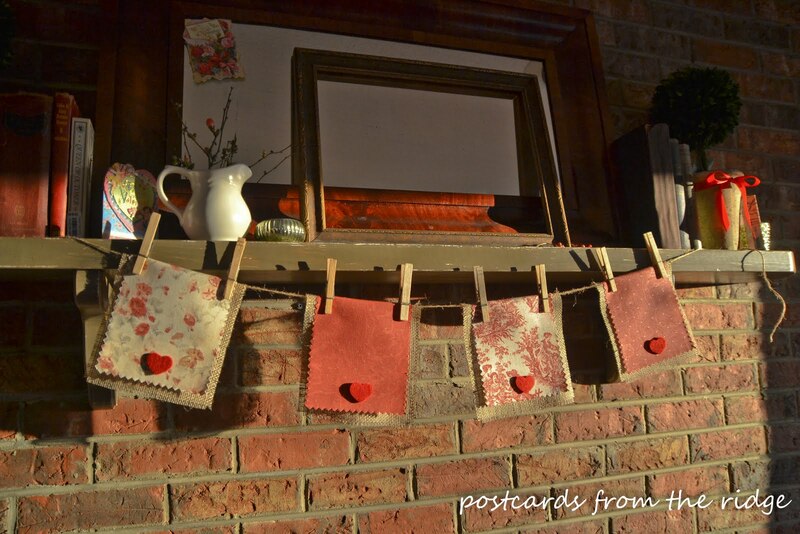 Currently the mantel has a little valentine's banner that I made from some fabric scraps. The empty frame and old books are yard sale finds. I added some branches from our flowering quince bush that I clipped yesterday. 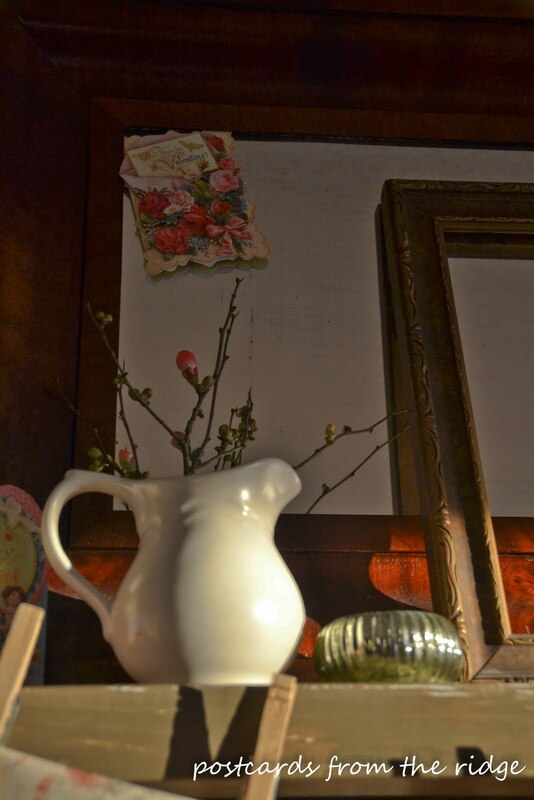 The little pitcher is a thrift store find. Another piece from my husband's family is the antique tea cart. It suits my taste better to use it as a bar cart. I'm more of a wine drinker and really don't drink cocktails very often at all, but I love the coolness factor that the bottles and shakers and decanters bring to the room. My mother-in-law wouldn't mind. She'd just be glad to see it being used! The sofa got a quick makeover last year by using a dropcloth as a slipcover. The pillows get changed out seasonally, and I've got a couple of rugs that I rotate in here. I'm looking at the picture right now and thinking it might change the rug back to the other one very soon. This one is a little formal for me. Am I the only one who changes things so quickly?? I hope you've enjoyed the tour. This is how it looks now, but I'm always changing things around here so I'm sure it won't stay like this for more than a few months, if that long! Stop by sometime and we'll sit by the fire and have a cocktail! 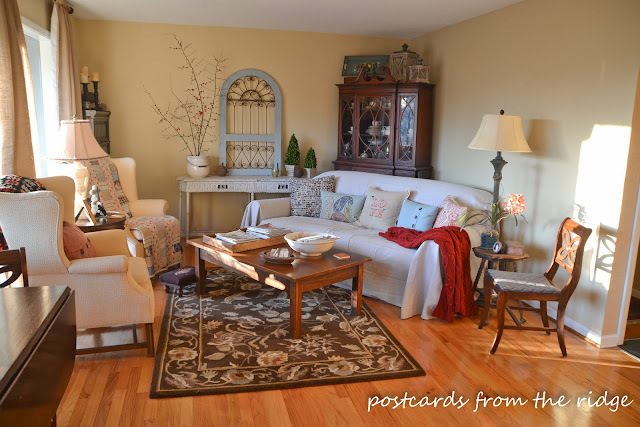 Angie, your living room is so pretty and cozy. To me, it makes a lot of sense to use the space the way you have. You probably have a much bigger kitchen than you would have had...and the dining room mostly just sits and gathers dust. I like that you've figured out a way to make it all work. Thanks, Stacey! This is about the 5th or 6th way I had the furniture arranged. I'll keep it this way for a while, and then will move it around again in a few months! We don't miss the dining room 99% of the time. You're right, they're usually just wasted space! I love how the couch now faces the window, so that you can take advantage of the view. 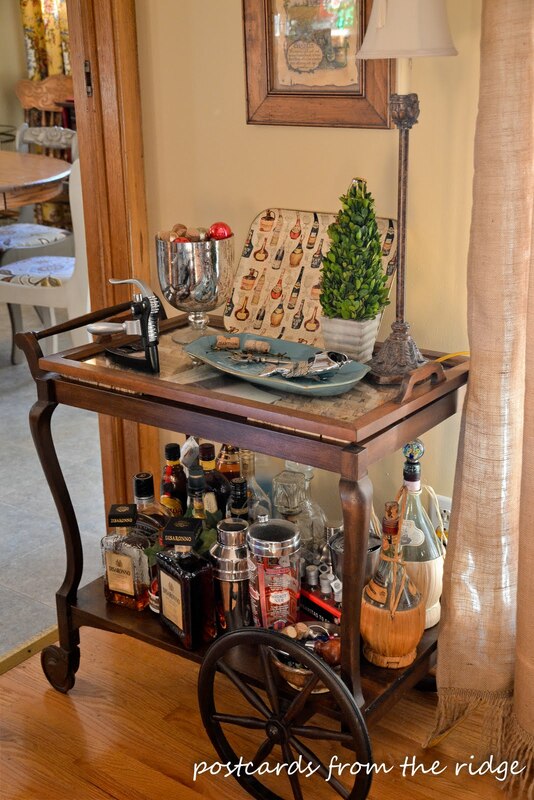 And I love the bar/tea cart - way cool! Yes, I'm enjoying the view with the couch where it is. It's nice to sit with my morning coffee (or evening wine) and look out the windows. And maybe I need to start making more cocktails to fully enjoy the bar cart! I love the look of it though! Thanks, Bill! I hope you're doing well! It's fantastic Angie! 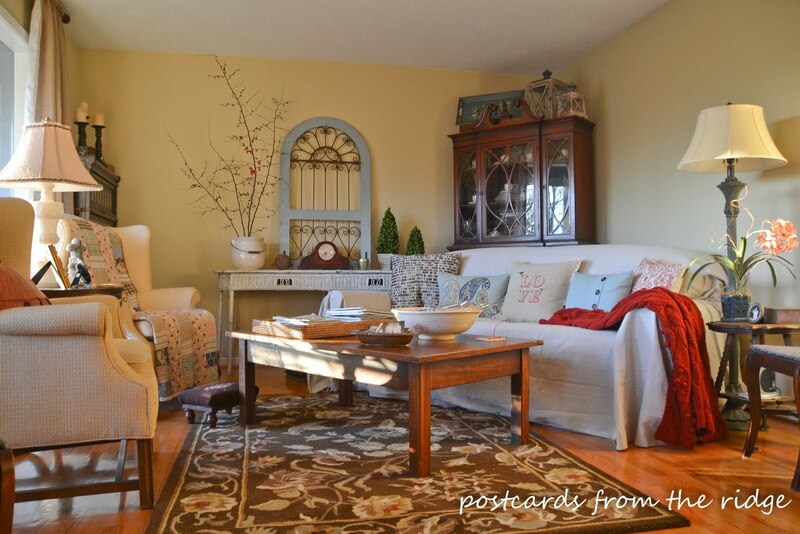 I love how you've combined family pieces in a space that you use and enjoy. The sunlight in the room is gorgeous... I think I could enjoy being in there for hours. 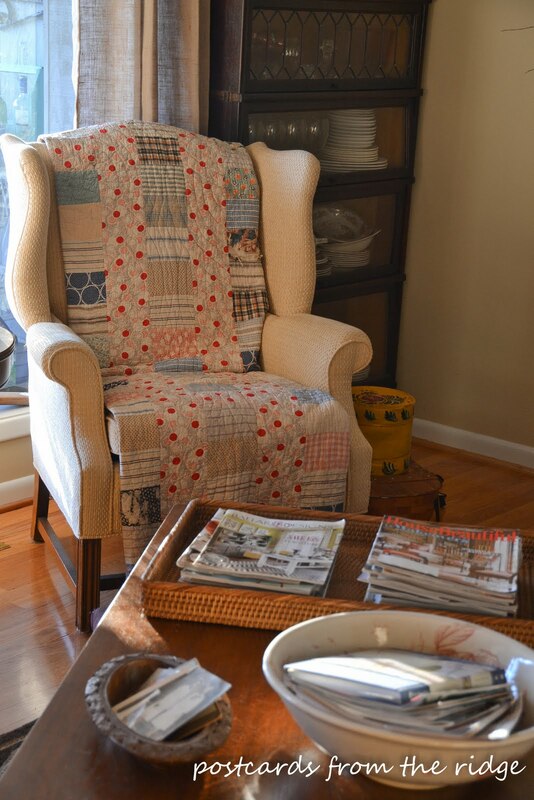 I loved your drop cloth slipcover back when you first posted it, and now I'm loving the rest of your living room. It's exactly my eclectic taste; unique, personal, and one of a kind charm that isn't seen anywhere else. I could move right in. Your room simply glows, and it's so apparent that your design style comes straight from the heart. I love it! Angie everything looks so beautiful! I love that you have your couch on an angel in the space. I just recently angled ours as well. I did not think I would like it but I do. Thanx for joining THT!